This is to outline and provide some basic and hopefully helpful introductory information to Civil Air Patrol glider operations for Arkansas Squadrons to participate with Oklahoma Gliding Program. This program is being lead by Maj Charles Rine and all questions should be directed to him as the Arkansas Gliding representative. Information on CAP Orientation rides for parents can be found here. It is very important that both cadets and seniors are prepared for flight operations and study the provided material well before the activity day. Failure to have this complete will prevent you from participating in the activity in any capacity. Don’t forget to print out the certificates! Completed certificates can be found in LMS Past Results . For those that are gliding, a current weight is required. Communicate to Maj Rine or local squadron point of contact that all tasks have been completed. Photography is encouraged. Material can be shared on social media but should show CAP in a good light. The glider has a go-pro mount on the wing which can be used during orides. This may be the first experience of small aircraft for many. It is important to remember this is about having fun. The more the cadet prepares for the event, the more they will enjoy it and will get more out of it. For those wanting more information, there is a cockpit guide here. Clothing should be plain, light colors (dark clothing will get hot) – be comfortable. Preferably the clothing identifies the cadet as CAP – cadet encampment gear is ideal. ABU’s and BDU’s can be worn, but will get hot. This is ideal attire for operations in winter months. Hi-viz safety vest or belts are required. Female – Shorts and T-shirt. No revealing tops. No short shorts. Footwear: Note that boots ARE NOT PERMITTED in gliders. They may be worn while not in the glider and are not a bad idea while moving around the airfield as gopher holes are not unheard of. Bring tennis shoes or similar light footwear to wear in the gliders. If conditions are forecast to be sunny, bring sunglasses, sunscreen and a wide brimmed hat (eg Boonie hat) to protect the neck – ones that have chin straps are ideal for when its windy. Seniors can also wear shorts and T-shirt and ideally will be identifiable as CAP eg CAP hat, T-shirt or blue CAP polo shirt. As in all CAP events safety is paramount. We will have a safety briefing at the hanger area before flying begins in the morning. 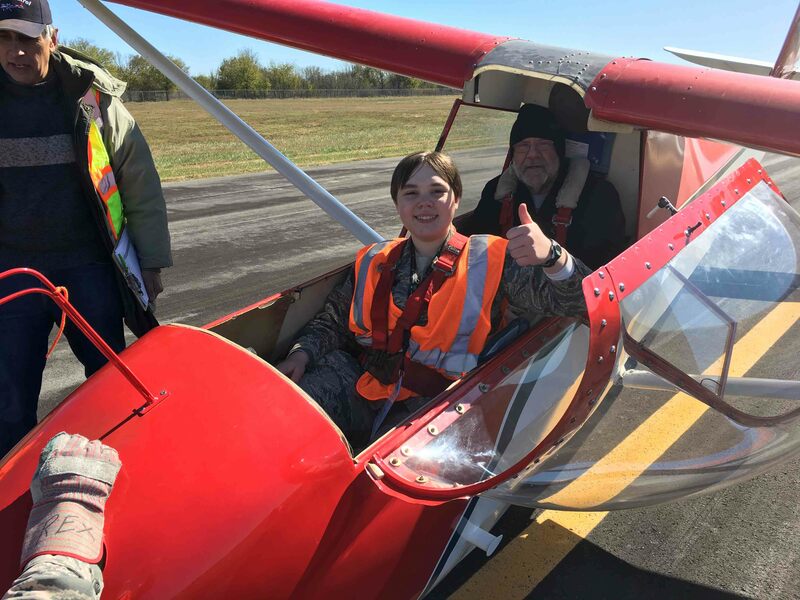 Flying cadets and crew member in training will receive instruction on preflight inspections, ground handling, and launching and recovering gliders. 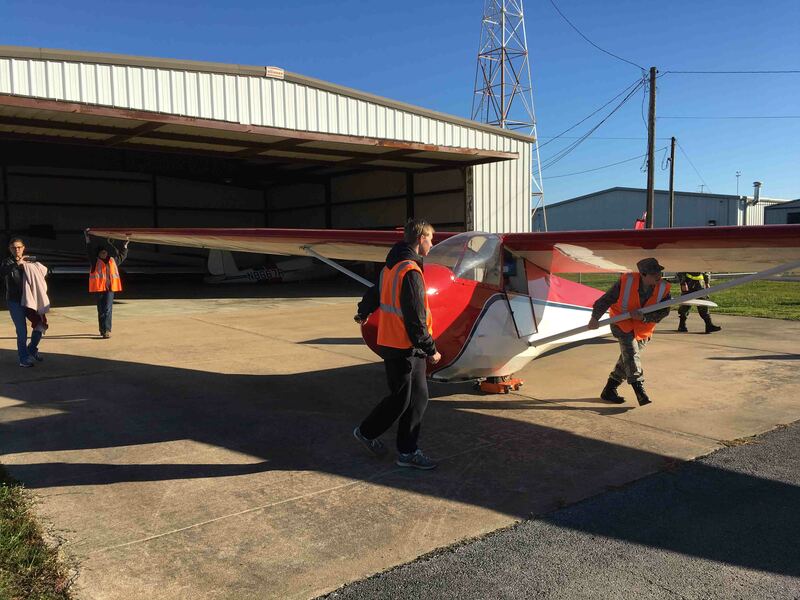 Tulsa Skyhawks will show how to get in and out of the glider to avoid placing pressure on the canopy which is fragile and expensive to replace. This is an active airport. Children, animals, others unfamiliar with aircraft operations must be supervised at all times. 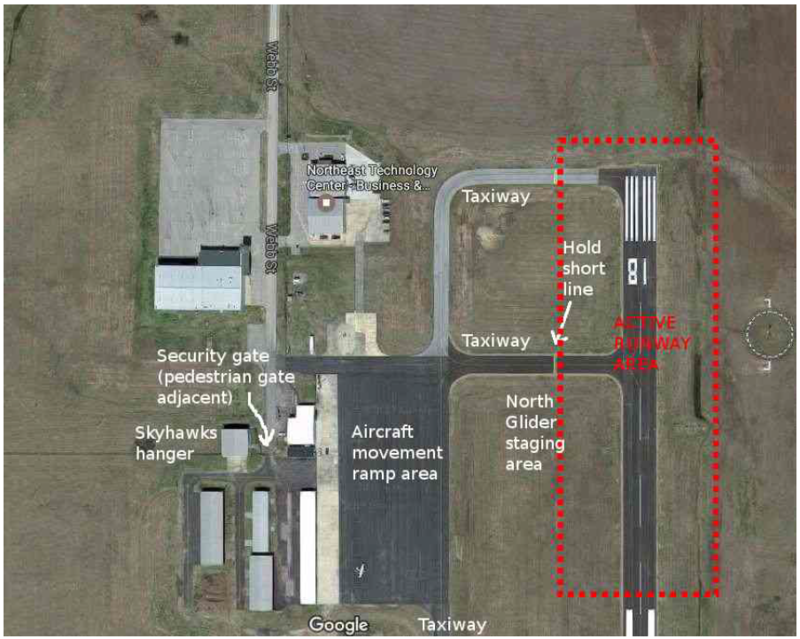 Foot Traffic and guests on taxiway are not permitted without direction from a Tulsa Skyhawks member or CAP Safety Officer. Please check in with a Tulsa Skyhawks or CAP member at the entrance gate for assistance when you arrive for the first time. The staging area is restricted. Personnel not directly involved in the glider operations must be cleared by the line supervisor to enter the area eg to take pictures. 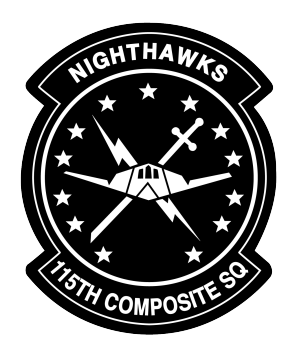 Tulsa Skyhawks crews will be busy with preflight inspections, ground handling, launching and recovery operations. The glider staging area is where the gliders are prepared for flight and are the taxiways adjacent to the runway – which one will be used depends on the winds on the day. As well as glider operations, the taxiiways will be used by the towplane and other powered aircraft. Keep vigilant at all times. The active runway area is that forward of the hold short line and is for gliders and aircraft only. All private vehicles should be parked in the terminal parking lot outside the gate. There is limited parking in the grass adjacent to the skyhawks hanger. airport road as Webb St. There is a security gate at the end of the road with limited parking. Park so as not to obstruct access. To get through the gate, there is a pedestrian gate to the left of the main gate.